UPDATE: We regretfully announce that Liu Xia is no longer able to attend this event. 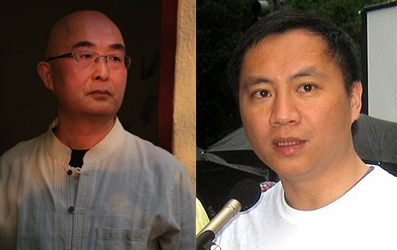 We are pleased to welcome Wang Dan who will join Liao Yiwu for this program. Thank you for your understanding. Please note that this event will be in Chinese, accompanied by English translations of poems. Chinese exiled writer Liao Yiwu was out of school in early years, took a succession of jobs and eventually became involved in avant-garde poetry in 1980s. In 1990, he was arrested after publicly reciting his poem Massacre in memory of the victims of Tiananmen Square, military crackdown on June 4, 1989, and spent four years in prison. After his release, he wrote several books, all of which were banned in China but sold well on underground market. One of them became first book to appear in English in 2008, as The Corpse Walker: Real Life Stories, China from the Bottom Up. For a Song and a Hundred Songs was published in English in 2013. He fled China in 2011 and has lived in Germany under asylum. Wang Dan was one of the main leaders in the event of student activities in 1989 in Beijing. Following the brutal crackdown by the Chinese government in June 1989, Wang Dan was put on the No. 1 of the “most wanted list” issued by Chinese government and sentenced for 4 years. He continued to advocate Democracy Improvement Activities as a free writer in Beijing after he was released from his first four-year prison sentence in February 1993.Thus he was arrested again in May 1995 and sentenced for another 11 years with an accusation of “Conspiring and Subverting Government”. Under the pressure of international societies, especially the United States, the Government exiled Wang Dan to the United States in 1998. He holds a Ph.D. in history from Harvard University and has been still active in promoting democracy and freedom for China. He launched the forum on Dialogue China on June 4th, 2018. His publication includes commentaries, poetry and prose like Dan Wang’s Memories in Prison, Walking alone in the Cold and others. Liu Xia is a poet, artist and founding member of the independent Chinese PEN Center. Her husband, literary critic and human right activist Liu Xiaobo served an 11-year’s prison sentence for “inciting subversion of state power,” then awarded the Nobel Peace Prize in 2010. Although never charged with a crime, Liu Xia disappeared under extralegal house arrest for her husband sentenced to prison for drafting a petition calling for democracy and human rights in China. After substantial pressure from German Chancellor Angela Merkel and the international community, Liu Xia was finally given freedom to leave China and arrived in Berlin after 10-year’s residential surveillance. The Silent Strength of Liu Xia is a collection of 25 black-and-white photographs Liu Xia produced between 1996 and 1999 while her husband served his second stint in a labor re-education camp. It is the only exhibition of Liu Xia’s photographic work in the United States. In 2015, a bilingual collection of Liu Xia’s poetry, Empty Chairs, was published by Graywolf Press.